The much awaited and highly anticipated WPF based IM client Yahoo! 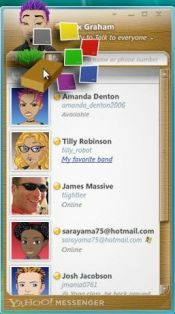 Messenger for Windows Vista announced back in January has been released for preview (read: pre-beta testing) free download. The Windows Vista version of Yahoo Messenger is designed from the ground up specifically to match Windows Vista beautiful and ‘wow’ user interface. No 64-bit (x64) support yet though Users can install the Yahoo Messenger for Windows Vista Preview Release side by side with existing Yahoo! Messenger 8.1 or 9.0 to continue using older version. Note: Yahoo! has updated the messenger client to support 64-bit Windows Vista. The build version has been updated from build 2007.12.06.420 to build 2007.12.06.421. You can download the full version standalone installer. Entirely new interface that harnesses the power of WPF, the graphics subsystem in Windows Vista. Organize your conversations into tabs, or drag and drop a tab out to create a new window. Keep up with your favorite contacts by dragging them into the Windows Sidebar gadget. Send enhanced emoticons that have some extra oomph. Change the color of your IM windows with a built-in skin chooser. Go crazy with a different skin for every IM window! Adjust the display size of your contacts with a handy slider. Arrange your contact list into multiple columns just by resizing your window. Send instant messages to your Yahoo! and Windows Live Messenger contacts. Send files to friends as large as 2 GB. Find contacts quickly with the contact search bar. Type in a few letters of the contact’s name or ID and they’ll come up in filtered results. As-you-type spell checker that’s smart enough to know that “LOL” is not something to correct. A preferences menu you can access by right-clicking anywhere at the top of the main Messenger window. However, beware that the following features are not included in the preview release: voice, webcam, chat rooms, text messaging to mobile phones (SMS), IMVironments, Audibles, plug-ins, photo sharing and conferencing. Well, you can consider it to be a ‘major downgrade’ with only upgrade on visual aspect! Download Yahoo! Messenger for Vista now (no longer valid). See also the video preview for the new Yahoo! Messenger for Vista on the YM blog, or below.